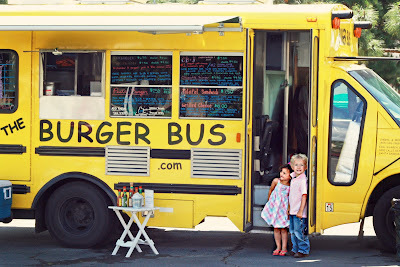 My girls and I met our friends for lunch at the Burger Bus in Santa Barbara today. The Burger Bus serves up gourmet burgers and uses all local and high quality ingredients including grass fed free range beef, freshly baked local ciabatta rolls, and produce from the farmers market. The kids clearly thought it was very cool to have lunch from a school bus. 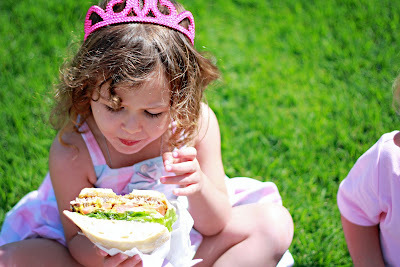 We plopped down on the grass for an impromptu picnic fit for a princess. Fresh yam fries and juicy burger with sweet grilled onions. I love this concept of gourmet food trucks. A few years ago I would have never thought I could get anything other than fatty low quality food from the side of a truck. But in the last few years that has all changed. Kogi has been wildly successful with it’s Korean BBQ truck in Los Angeles, as has Milwaukee’s Streetza, a truck serving gourmet pizza. And Tropical Taco in Hanalei, Kauai will always hold a place in my heart as having the best and freshest crunchy beer battered fish tacos I have ever had. Sprinkles has a cupcake truck too, but after Enjoy, their truck, and their cupcakes seem rather boring. Sorry Sprinkles, I still love your red velvet cupcakes and thank you for starting the cupcake craze. What gourmet food trucks are in your town? I only wished they had gourment trucks in my town. I always laugh when I drive by this empty lot next to a house down the road from us. They have a “truck” and a sign for Southern BBQ Friday – Saturday from 11:00AM – 2:00PM. I look at the truck, the house, the 2 picnic tables and think, really? How fun! 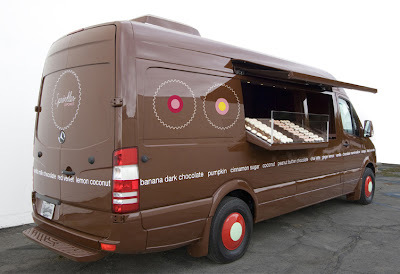 I've seen the gourmet trucks in big cities but I have never heard of cupcake trucks. This might be the best food post, ever!!! I love food trucks. Kogi, has my heart!!! Wow, thanks Val! I might have to make a trip down to LA to try Kogi for myself. You also need to move to San Diego – because we would get along swimmingly. Nothing like a good “food bus” (Sophia's name for these trucks). Can you believe she waited an hour in line for the Korean food truck?! They were in SB last April. Crazy girl knows good food! O Street Truck is opening soon in Santa Barbara as well. check out the website. food looks yummy!